It has been a few years since we had a Directory and we would like to produce one again – but we can’t without your help. If you would like your name and address published in our Directory – which will be available on-line to registered CYM website users – please complete this form (Directory Permission Form – MS Word) or (Directory Permission Form – PDF) and return it by post, fax (613-235-1753) or you can scan and email it to the CYM Office. Psst. Hey you. Quaker Meeting. Yeah, you. I know about you. I read your minutes and your State of Society reports. I know what you’re good at. You’re good at hospitality: celebrations, potlucks, welcoming new people into your midst. Social justice: prisoners, refugees, small African countries, homeless folks. Discussion. Lord, you’re good at discussion! It doesn’t always lead to action – or even decision – but goodness can you discuss stuff! I also know what you struggle with. Quaker process in business meetings. The quality of worship. Vocal ministry. Too much silence. Not enough silence. Teaching children and new Friends about traditional Quaker practices. Finances – having enough, knowing where you can spend them, knowing how to report them. Knowing Quaker history. Conflict. And I know what you love. You love visitors! It shines through all your minutes, reports, and newsletters. Visitors from other Meetings, other countries, other churches, other traditions. Visitors bring you together in community. They spark joy and interest. A visitor can teach you, help you with the places you struggle, and celebrate with you the things you do well. Visitors help you see yourselves through new eyes, and know yourselves better. So why don’t you have more visitors? You know you love it. Go on, invite someone. It’ll be wonderful. You’ll both grow stronger. 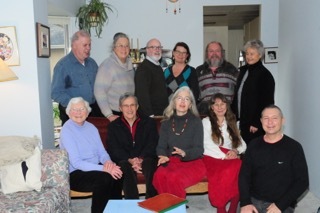 Do you have a story to tell, or a creative gift to share with Quakers in Canada? 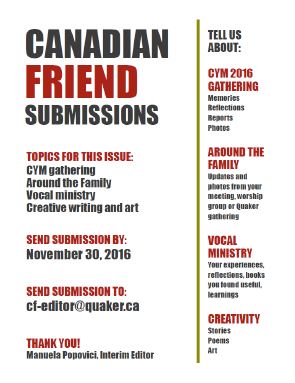 Contributions are invited for the new issue of The Canadian Friend, the twice-yearly magazine of Canadian Yearly Meeting (CYM). Prose, poetry, art, photos, etc. are welcome. Topics could include this past summer’s CYM gathering, updates or photos from your Monthly Meeting or Worship Group, books you’ve read, or something new you’ve experienced or learned. To take a trip down memory lane or seek inspiration, The Canadian Friend back issues are available online. If your library is missing one, you can even download back issues and print them. For Friends who don’t have internet access (and those of us who don’t always check our email), consider distributing or posting paper copies of this Call for Submissions poster. When you submit, the editor will work with you to make your piece consistent with The Canadian Friend’s technical guidelines, if necessary. Reading through the guide in advance can help both you and the editor get your piece ready for print more quickly. You can order a print subscription to The Canadian Friend by contacting the editor. The Canadian Friend also accepts advertising! Send camera-ready or clear, readable copy to the editor, by e-mail. For rates and details, contact the editor, above.